Our December 9 Broadcast/Easy Ed and Stacy Thornton at Brass Union December 14/Raging Teens December 23/The Nashville Boogie! If you missed our December 9 broadcast you can download the (always free) MP3 by clicking here. The songs are listed at the bottom of this blog post, along with a description of what this one was all about. (It was a little different from our normal take.) As always, thanks for listening. While I have you, take a look at these upcoming live events! 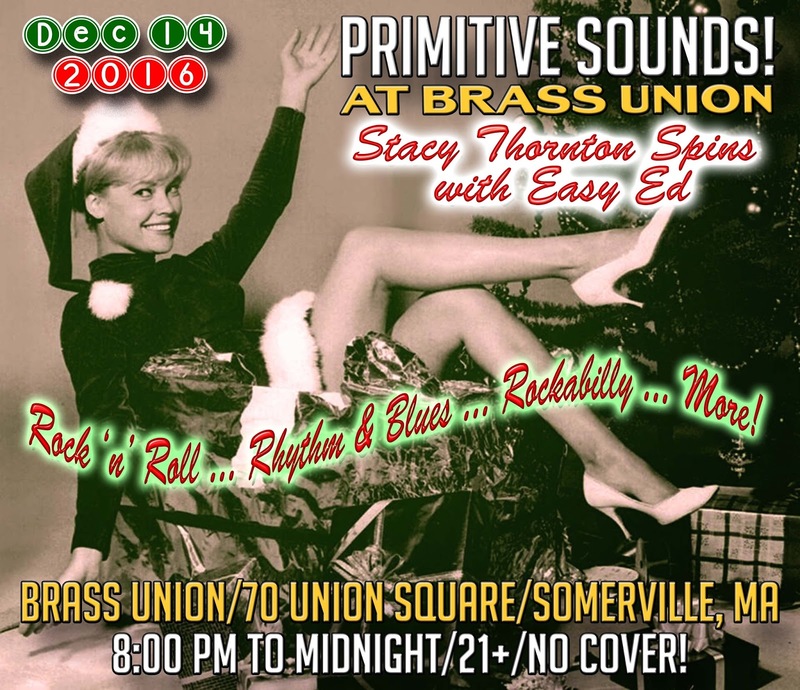 December 14, 2016: Primitive Sounds at Brass Union is excited to have Stacy Thornton hit the decks with Easy Ed on December 14! 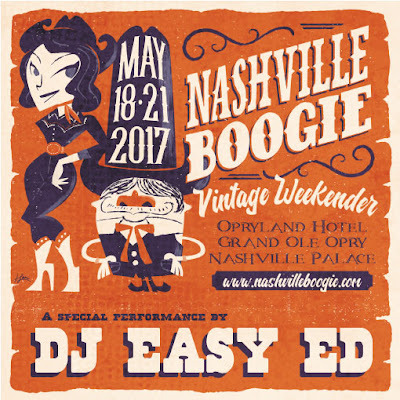 Early 8:00 PM start, no cover, excellent menu and cocktails--and lots and lots of cool 45s spinnin' on the decks all night long. More info here. 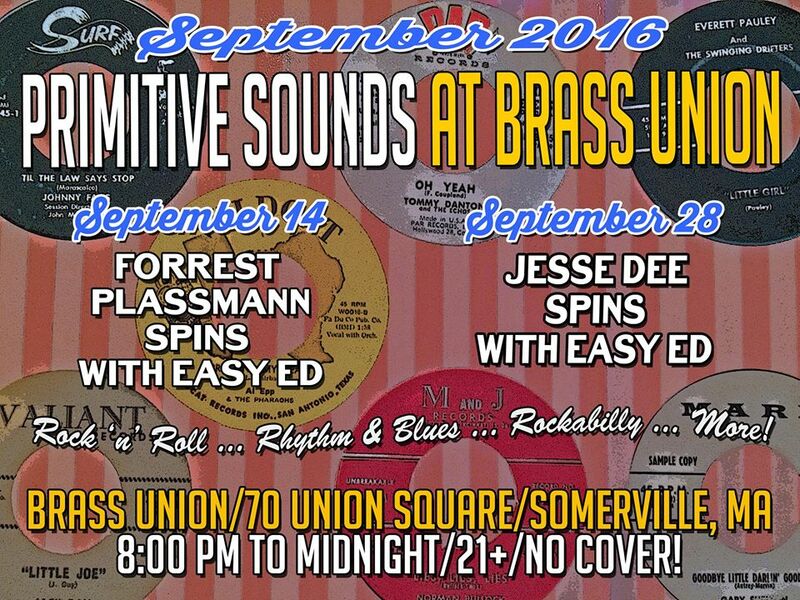 Brass Union: 70 Union Square in Somerville, MA 02143. 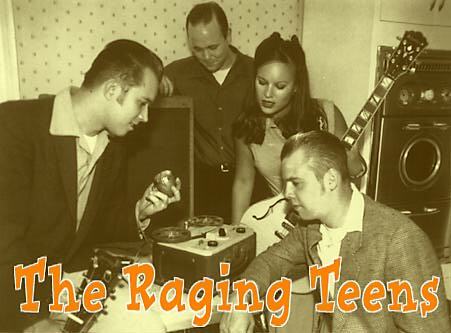 We're super-excited for the Raging Teens' 20th Anniversary Show/Holiday Party on December 23. There will be two separate shows. The late one (with The Roy Sludge Trio and Ten Dollar Mistake) is sold out. There may still be tickets for the early show. Check here. 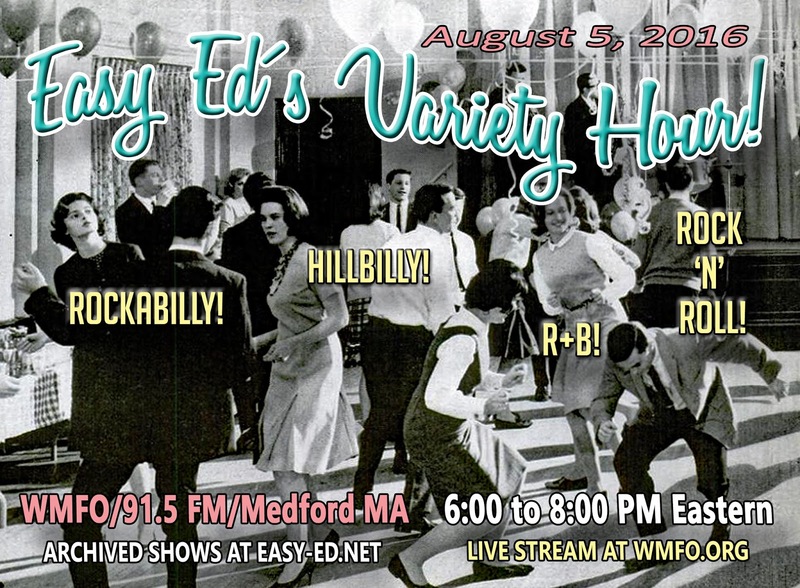 Easy Ed's Record Hop will be spinnin' the wax the whole night! Easy Ed's Record Hop will be spinning at the Nashville Boogie, May 18-21, 2107, in Nashville, TN. Check out the cool flier they made for us! 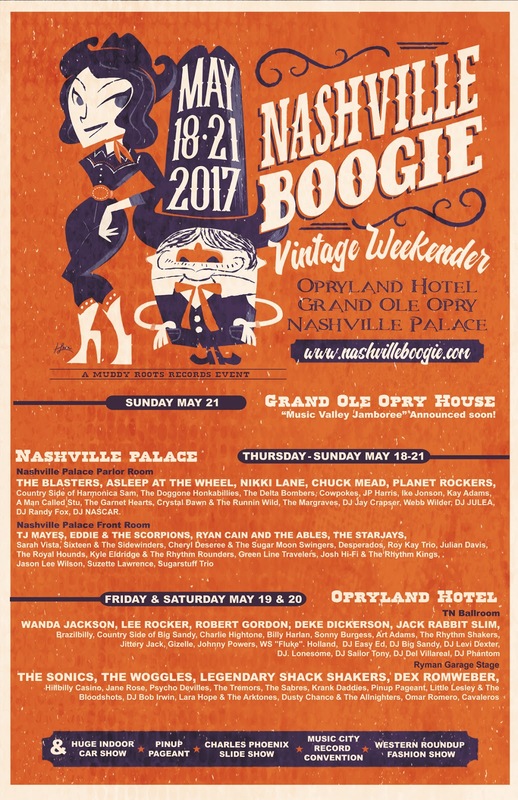 Thank you, Nashville Boogie, for inviting us to spin. Can't wait! Here's what we played on the December 9, 2016, show. 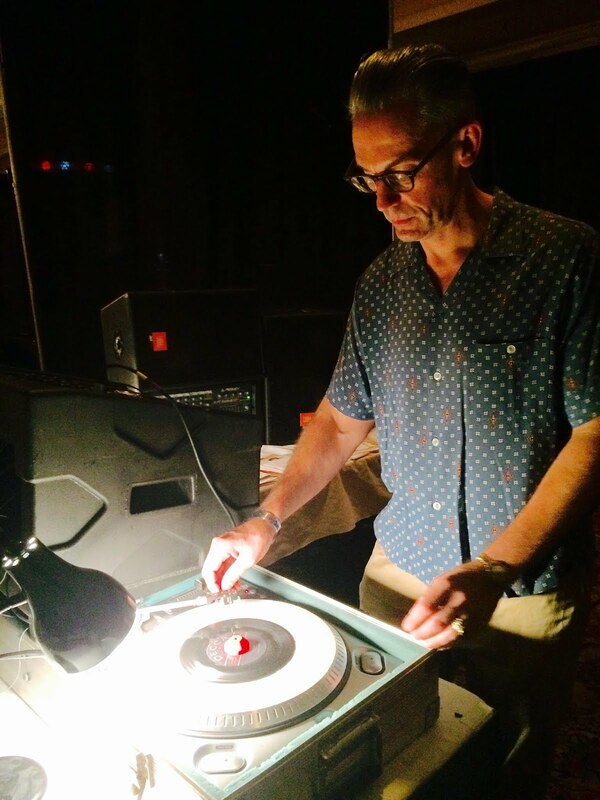 All selections were 45s from the 200-record road box I bring to live shows in the Boston area. I'm always adding and removing records from that box, but all of these picks were in the current rotation as of this week. Enjoy, and Happy Holidays, everyone! 1. The songs from last night's show are listed below. 2. The (always free) archive MP3 for this show is available for download here. 3. We are eternally grateful to Billy Miller, co-founder of Norton Records, for the tons of cool songs he found and released to the world at large. We play Norton material on almost every show. Rest in peace, Billy. 4. Thanksgiving Eve: Join me at Brass Union in Somerville, MA, for a very cool rockin' record party, with DJ sets by me and my good buddy Forrest Plassmann. 8:00 to 1:00, 21+, no cover, cool venue, table games, excellent food and drink. 5. Keep your records clean and sleeved in a climate-controlled space. But if they're beat up, play 'em anyway. Play them! Records are not museum pieces. They are there to be enjoyed by you today. 6. Life is short, and it goes by quickly. Be good to your fellow human beings and animals. Al Caiola “Guitar Boogie” from n/a on United Artists 45 — United Artists 1962. We salute you, Al Caiola. Rest in peace. Norton Records Tribute. Thank You, Billy Miller, for the Great Kicks! Bobby Fuller “Keep on Dancing” from El Paso Rock: Early Recordings, Vol. 1 on Norton — Thank you for everything, Billy Miller! Long John Hunter “El Paso Rock” from Ooh Wee Pretty Baby! on Norton Records — Happy Thanksgiving! 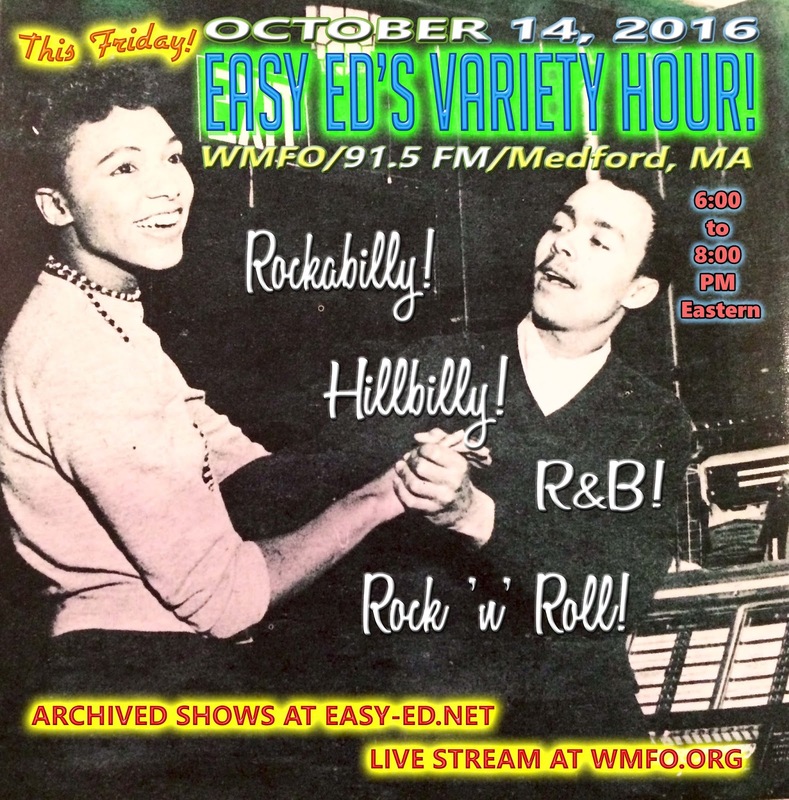 Easy Ed's Variety Hour November 4, 2016 + Primitive Sounds November + More! 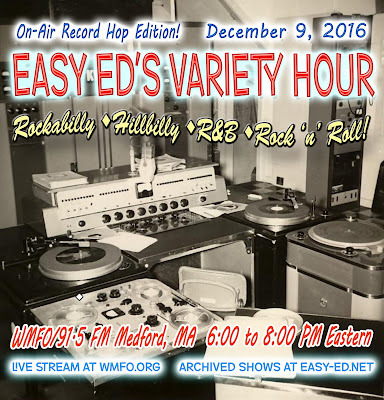 Missed last night's show (November 4, 2016)? Just click here to get to the always-free archive mp3. Scroll down to see the songs we played this time out. Like what you hear? 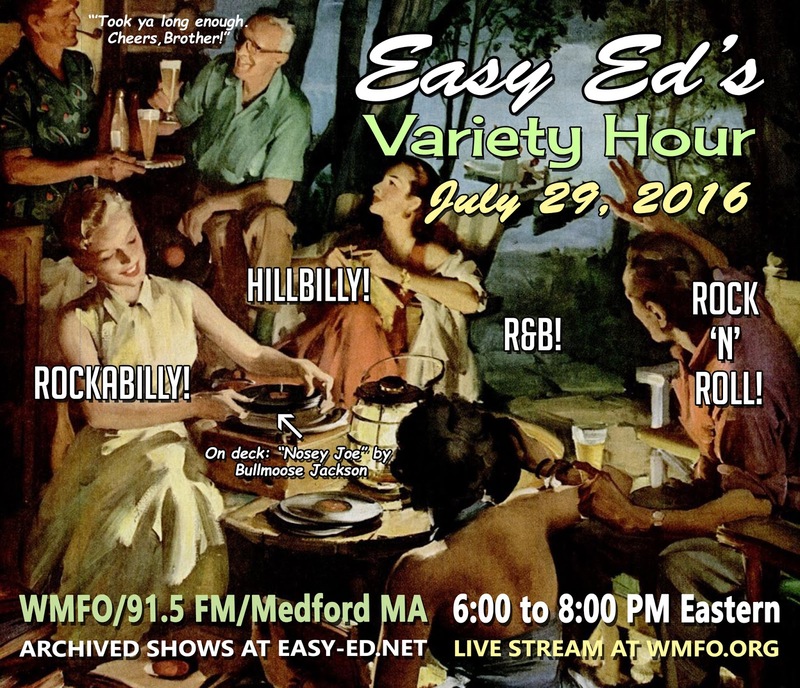 Please comment on the Easy Ed's Variety Hour Facebook page. Thank you for your support! December 23: Get your tickets (please do--this show's about to sell out) for the Raging Teens' 20th anniversary celebration/rockin' holiday show at O'Brien's in Allston. With Roy Sludge, Ten Dollar Mistake, and Easy Ed's Record Hop. Billy Harlan “I Wanna Bop” from Various: That'll Flat Git It! Vol. 2 on Bear Family Records — Decca Records 1958 /See him at the Nashville Boogie, May 18-21, 2017. Big Sandy and His Fly-Rite Boys “Chalk It Up to the Blues” from It's Time! on Yep Roc Records — www.bigsandy.net See them 11/12 at the Lizard Lounge in Cambridge. And I will see you there. If you missed our latest live broadcast (October 14) you can find the always-free archive mp3 right here. (The songs are listed below.) Thanks for listening, tell your friends, and enjoy! This episode features a slew of new (old) 45s unearthed at the Allentown show; brand new releases by Jittery Jack and Darrell Higham, the Millwinders, and Pat Capocci; a Gene Vincent tribute; and much more. I'm excited to announe that I've been asked to DJ the Nashville Boogie coming up in May 2017. Check out the full lineup here. Yow! 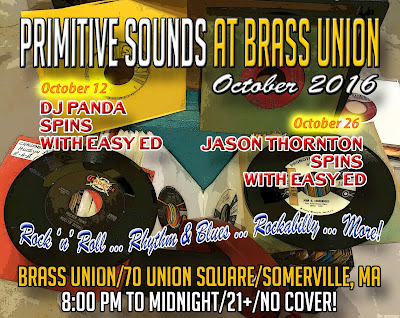 Much sooner (October 26) I'll be spinning the Primitive Sounds at Brass Union in Somerville, MA. My special guest will be Jason Thornton. Come on out! Early start, great food and drinks, and a great sound system. 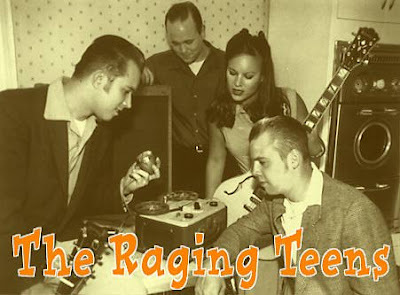 Remember to get your tickets for the Raging Teens 20th Anniversary show (December 23)! The Millwinders “Love Me So” from It’s Love on Self-Released — Brand new release! Pat Capocci “Coming In Hot” from n/a on Ruby Records 45 — Brand new release! The September 30 Broadcast--And Lots of Links! If you missed Friday's broadcast don't fret. You can find the (always free) archive here. Thanks for listening. 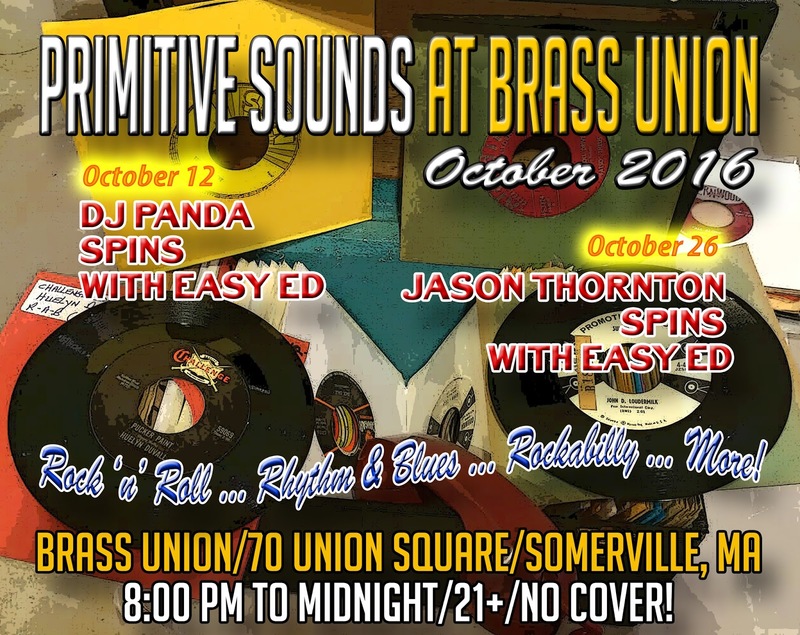 Primitive Sounds (one of Boston's longest-running DJ nights) has a new home base: Brass Union in Somerville. We're there spinning records the second and last Wednesday of every month, starting at 8:00 PM. Next time out (October 12) I'll be sharing the decks with DJ Panda! The Raging Teens just scheduled a 20th anniversary show in Boston (December 23) and Easy Ed's Record Hop is proud to be part of the event. 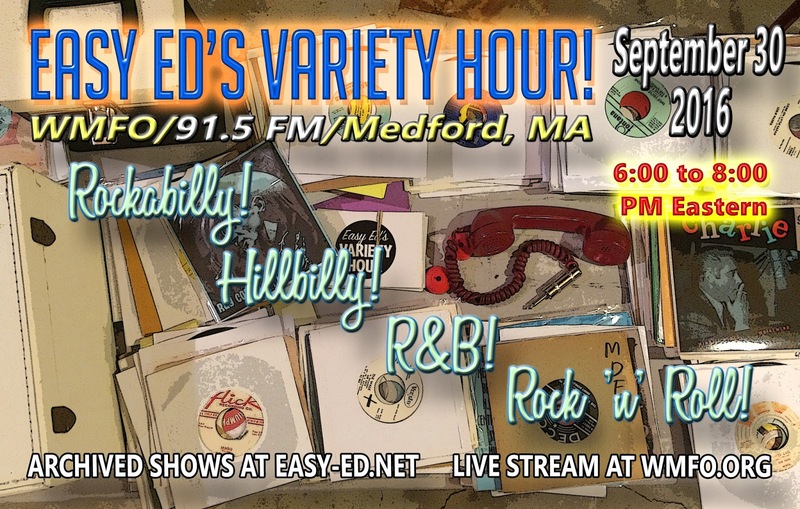 In closing, I want to mention that my radio station, WMFO in Medford, is running a fundraiser to keep our all-volunteer/student station operating. 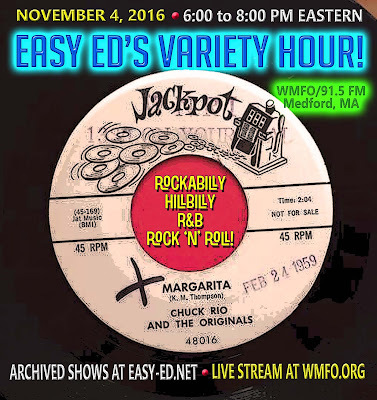 If you enjoy my show, I encourage you to toss a dollar or two in the collection plate--and to te'll 'em you listen to "Easy Ed's Variety Hour" when you do. Much appreciated! You can donate here. Jean Shepard “Jeopardy” from Capitol Records 45 on N/A — Capitol Records 1959. Rest in peace, Jean Shepard. Joe Clay “Slippin' Out, Sneakin' In” from Various: Get Hot or Go Home on Country Music Foundation Records — Recorded for Vik Records 1956 (originally unissued). Joe Clay, your fans will miss you. Frankie Lee Simms “She Likes to Boogie Real Low” from n/a on VIN Records — VIN Records 1958. For Jason Beek, who is currently on the air in Boise. Check out his "Spoonful" show! Jerry Lee Lewis “Breathless” from Classic Jerry Lee Lewis on Bear Family Records — Sun Records 1958/Happy birthday, Jerry Lee! If you missed last Friday's broadcast you can download the (always free) archive from here. The songs are listed below. Enjoy! This Wednesday (September 14) come on out to Primitive Sounds DJ night at Brass Union! All vinyl, all night, and lots of fun, fun, fun. 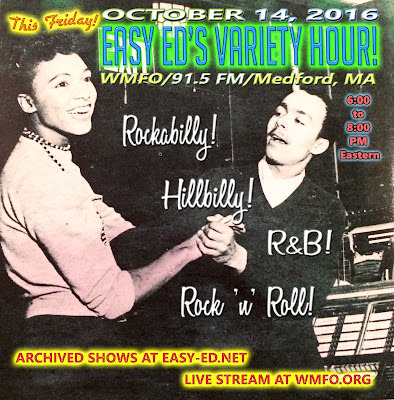 Vintage rock 'n' roll and R&B, exotic instros, rockabilly, and more. 8:00 PM to midnight. No cover. My cohost P.J. Eastman has moved away but will be back to spin whenever possible. 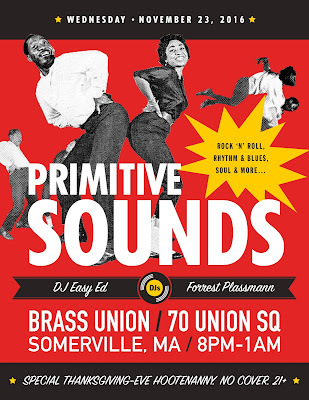 I will keep Primitive Sounds--one of the longest-running DJ nights in the Boston area--going strong at our new home, Brass Union, DJing twice a month alongside special guest DJs from the Boston area. This week I will be sharing the decks with Forrest Plassman--one of our favorite DJs from our days at River Gods. Forrest spins a fantastic mix of vintage R&B sounds that'll knock you out! 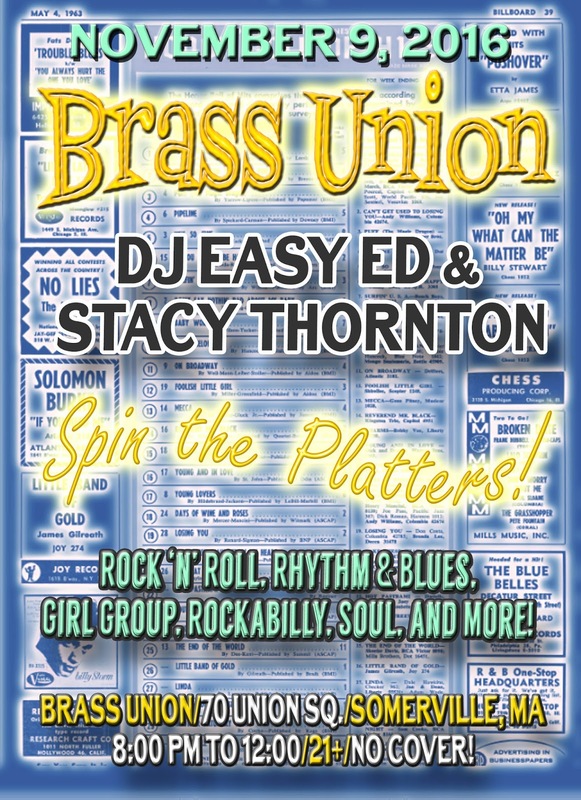 Brass Union has outstanding food and drinks, a super-friendly atmosphere, dance floor, table games, and always lots of great folks stopping in. Come on down, have a round, and dig the Primitive Sounds! Boston rockabilly legends The Cranktones will play a special, early show at Atwood's Tavern in Cambridge on Saturday, September 17 at 4:00 PM. Cool! The New England Shake-Up--a fantastic rockabilly weekender in Sturbridge, MA, is just two weeks away (September 23-25). The band and DJ line up can't be beat! Check out the details (see the link) and get your tickets! I'm happy to be DJing the event once again. Hope to see you there! The Rip 'Em Ups “Don’t Run Away” from Killswitch! on Rhythm Bomb Records — www.facebook.com/theripemups?fref=ts See them at the New England Shake-Up Sept. 23, 24, 25, in Sturbridge MA. Tickets and info at http://www.newenglandshakeup.comhttp://www.newenglandshakeup.com/. Benny and the Cats, Featuring Charlie Thompson “Good Deal Lucille (feat. Charlie Thompson)” from Benny and the Cats Meet Charlie Thompson (feat. Charlie Thompson) - Single on Elegante Music — Released 2015 See Charlie Thompson at the New England Shake-Up Sept. 23, 24, 25, in Sturbridge MA. Tickets and info at http://www.newenglandshakeup.com/. The Cranktones “Right By My Baby” from Vibrate with The Cranktones on Rhubarb Records — See the Cranktones 9/17 at Atwood’s in Cambridge. Early (4:00 PM) show! Deke Dickerson & The Ecco-Fonics “Beat Out My Love” from Rhythm Rhyme and Truth on Shout! 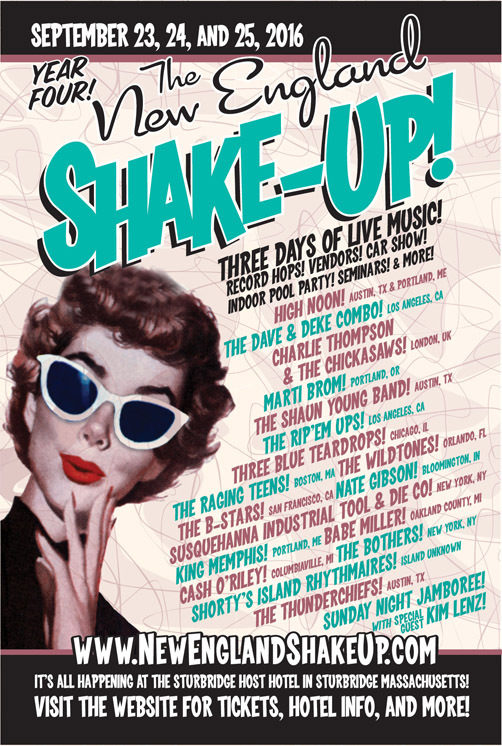 — See Deke Dickerson(Dave and Deke Combo) at the New England Shake-Up Sept. 23, 24, 25, in Sturbridge MA. Tickets and info at http://www.newenglandshakeup.com/. 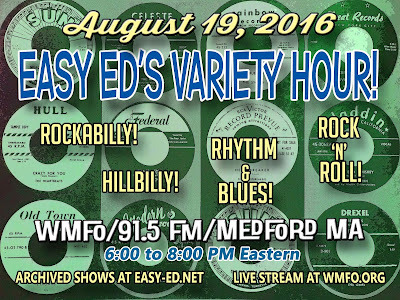 August 19 Edition of "Easy Ed's Variety Hour"
If you missed the August 19 broadcast you can find the archive mp3 here. The songs played are listed below. As always, we greatly appreciate your interest in this show--thank you for listening! Remember to check out the New England Shake-Up, which takes place at the end of September. If you're going I will see you there! I'll be DJing, hearing lots of great music, and catching up with friends. Hope to see you! OK, I haven't cleaned my record room in a month and I can't find anything, so I'm going to throw on a Maurice Williams and the Zodiacs LP and get busy with some 45 filing. High Noon “Ain't It Wrong” from Glory Bound on Goofin' Records — See them at the New England Shake-Up Sept. 23, 24, 25, in Sturbridge MA. Tickets and info at http://www.newenglandshakeup.com/. Charlie Thompson “Look at That Moon” from The Rockin' Side of Charlie Thompson, Vol. 1 on Tail Records — See Charlie Thompson at the New England Shake-Up Sept. 23, 24, 25, in Sturbridge MA. Tickets and info at http://www.newenglandshakeup.com/. The Retrobaits “Don’t You Be Gone Long” from Your Squeezes Don't Leave Me on Western Star — Great! The Chartbusters “She's the One” from n/a on Mutual Records 45 — Mutual Records 1964--for Tony! If you missed last night's show you can download the (always free) archive MP3 from here. The songs we played are listed below. On August 10 I'll be spinning records with P.J. 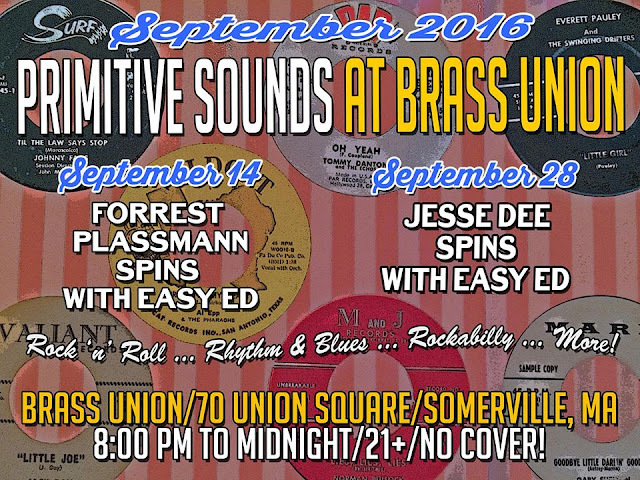 Eastman at Brass Union in Somerville, MA (8:00 PM to closing). Hope to see you there! The Dave and Deke Combo “Moonshine” from There's Nothing Like an Old Hillbilly on Bucket-Lid Records — See them at the New England Shake-Up Sept. 23, 24, 25, in Sturbridge MA. Tickets and info at .http://www.newenglandshakeup.com/. 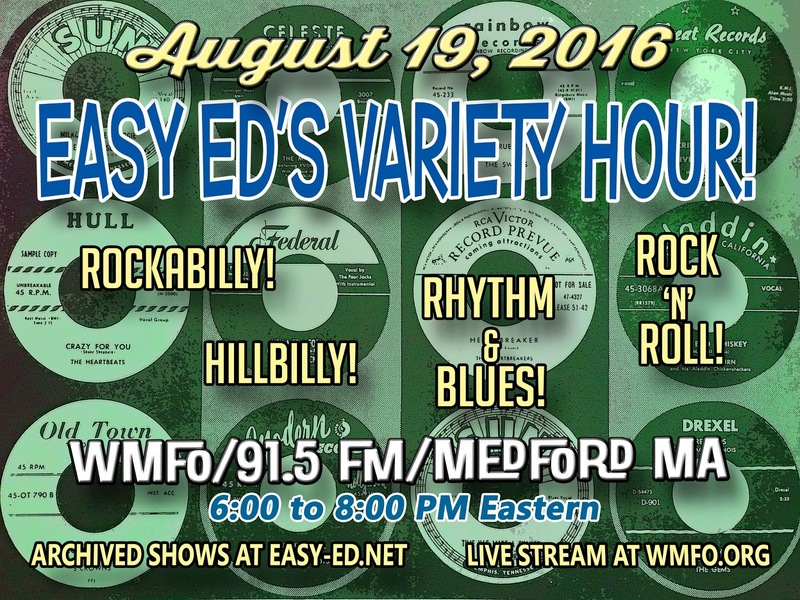 If you missed the July 29 broadcast, just click here to download the free archive mp3. The songs from this episode are listed below. 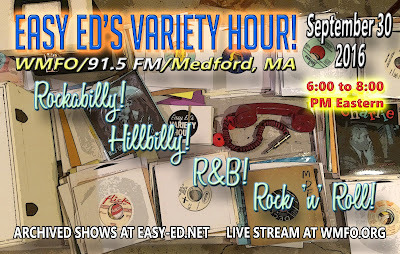 This show features excellent new tracks by Kieron McDonald, the Retrobaits, the Starjays, the Fanatic IV, Scotty Baker and Darrel Higham, plus lots of old favorites--and some tracks I've never gotten to before. Reminder: The New England Shake-Up--a world-class rockin' weekender--takes place September 23-25. Check out the fantastic line-up, and get tickets, at http://www.newenglandshakeup.com/. We've been away from the studio for several weeks. Apologies to you folks who regularly listen live or download the archive. Real life blocked the road for a while, but things have more or less smoothed out now. A lot has happened in the last few weeks, including the awful, sudden closing of my local live-DJing home River Gods. (I will likely talk more about that in a future blog post, but you can see some of my published comments here.) Generally speaking, this has been a year of too much change. In closing I'll just say--and I don't mean that in some trivial way--thank god for rock 'n' roll. It has gotten me through some dark times. Long live Gene Vincent! Scotty Baker and Darrell Higham “Since My Baby Met You” Yet-to-be-released single. Fantastic! Charlie Thompson “I Like That Kind” from The Rockin' Side of Charlie Thompson, Vol. 1 on Tail Records — See him at the New England Shake-Up Sept. 23, 24, 25, in Sturbridge MA. Tickets and info at http://www.newenglandshakeup.com/. The Retrobaits “I Tried, You Lied” from Your Squeezes Don’t Leave Me on Western Star — Big thanks to the band for sending me a copy of their debut CD. It's a great one! The Sabres “My Hot Mama” from Various: Get Your Kicks: 25 Vintage Rockers on Big Mike's — Demo. Late fifties. The Rip 'Em Ups “I Wanna Love You” from Killswitch! on Rhythm Bomb Records — See Them at the New England Shake-Up Sept. 23, 24, 25, in Sturbridge MA. Tickets and info at http://www.newenglandshakeup.com/. PS: We started the broadcast, unofficially, a half hour early, playing an extended set of instrumentals to get the night started. If you'd like to see the instros played in the first half hour you can see them here..